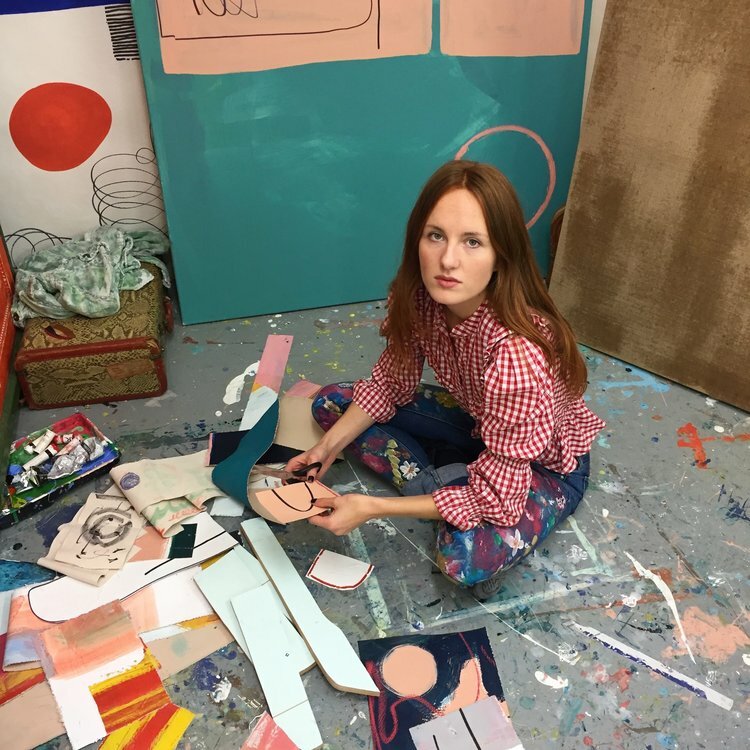 Brixton-based painter Milla Eastwood and I first met at the preview of her critically-acclaimed solo exhibition Drunk on Colour at The Dot Project in Chelsea. Combining traditional and contemporary techniques, I thought her a perfect fit for Digiqualia. Although I have always favoured gestural, abstract paintings, I was yet to experience her energy and dynamic colour palette. She composes her expressive work in her expansive Brixton studio, and sometimes even ventures to botanical gardens and natural landscapes. 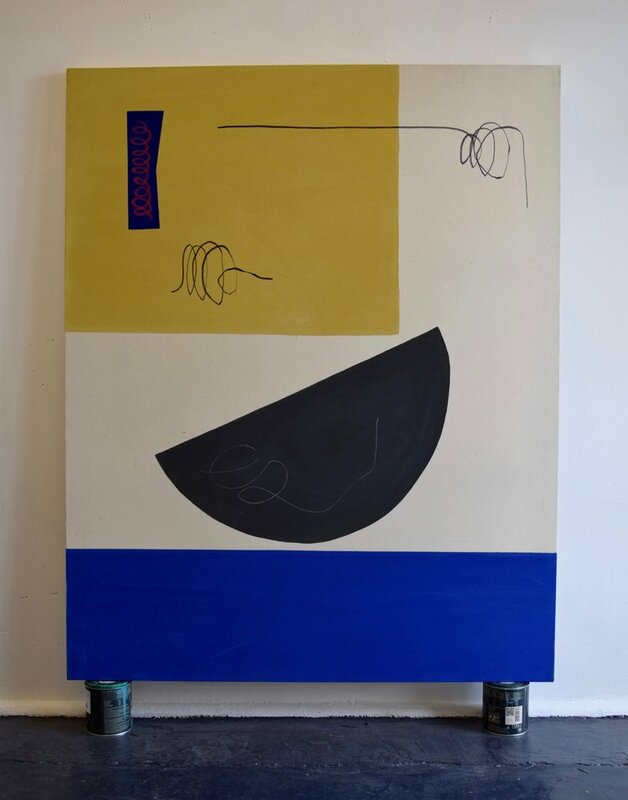 With her natural sense of community, Milla regularly visits other artists' studios and consciously keeps up to date with exhibitions at London galleries such as Fold Gallery, Rod Barton, Limoncello and Studio Voltaire. And her favourite shows last year? The Royal Academy School Show 2016, Kes Richardson at Fold Gallery, Donna Huanca at Zabludowcz Collection, Magnus Plessen at White Cube. Each individual mark on Milla's canvases is layered and complex, with every line and form playing an important role within the overall composition. Be it the blocks of colour, slashes or shapes, they are all indicative of the evocative experience of the viewer. In fact, her cutting-edge paintings don’t just exist within the confines of the canvas, but overflow into the room creating a realm of shared space with her audience. Watch the film we made about Milla Eastwood on Vimeo. 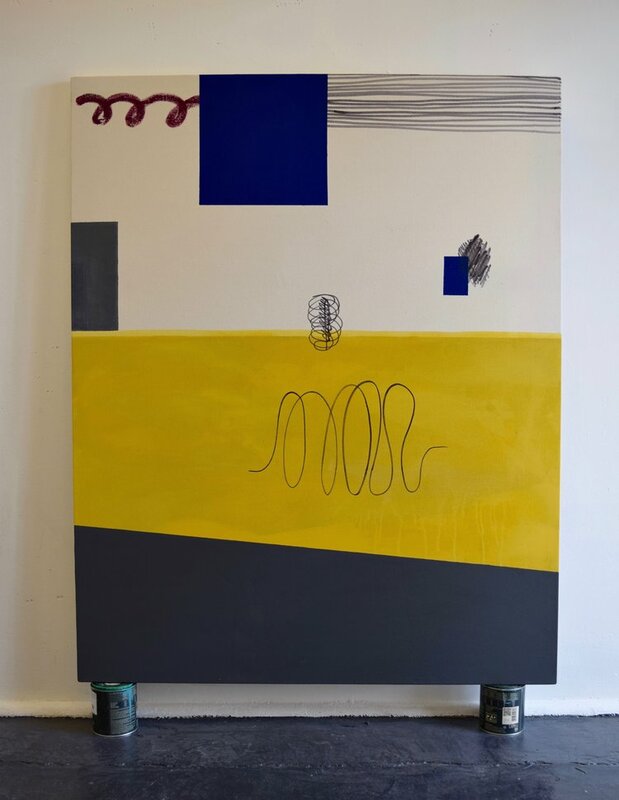 Milla is interested in the artwork of Jonathan Lasker, Phoebe Unwin, Mandy Lyn Ford, Eddie Martinez and Tal R, but it's the work of fellow emerging artists such as Rafal Topolewski, Laurence Owen, Stevie Dix and Thom Trojanowski Hobson that really captures her imagination. For me, I find her work particularly captivating, because she embodies the accessible, collaborative atmosphere shared amongst emerging artists in London. 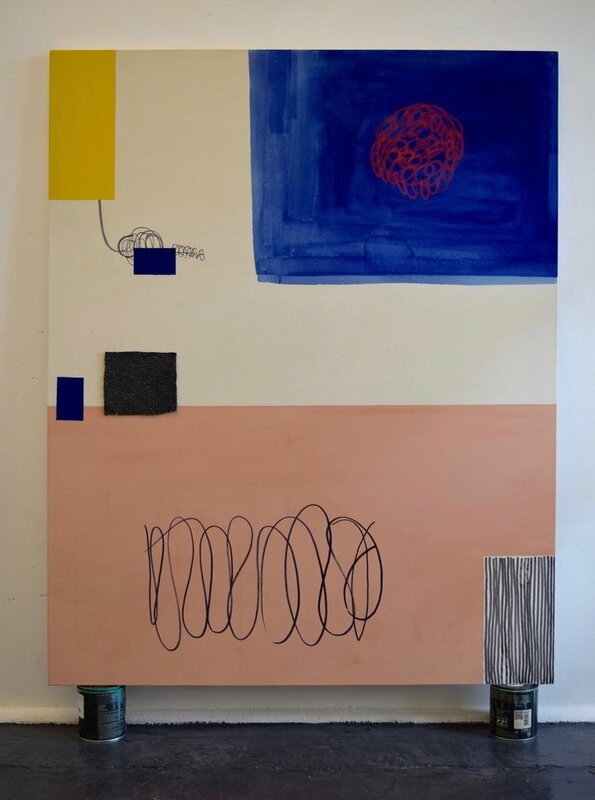 Milla's solo exhibition 'Cable Salad' opens at The Dot Project on Thursday 23rd March from 6-9pm. No, I’ve been creating for as long as I can remember. I start intuitively by setting down a group of forms. The forms are my initial response to the surface and to the space. 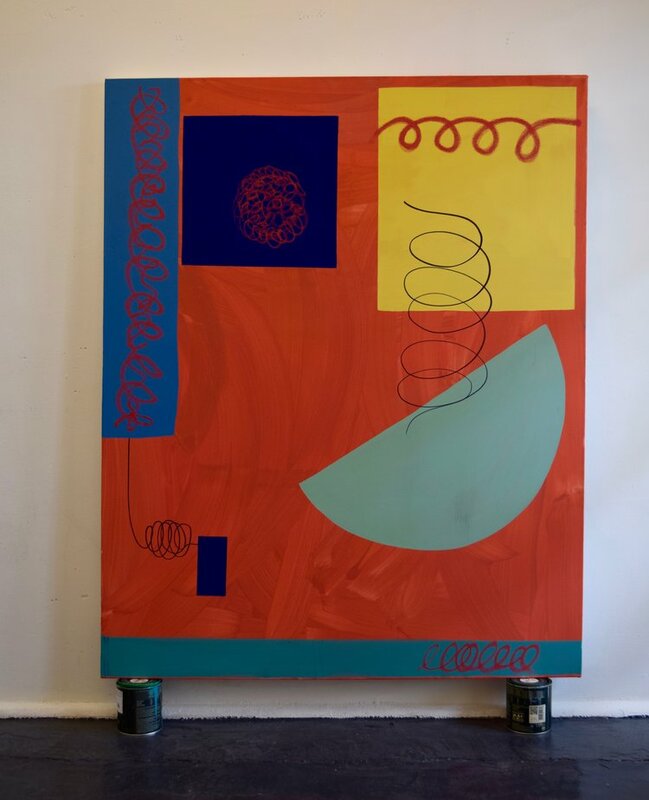 When I approach the paintings my aim is to embody the forms within the work, so that they are contained within the space and act as a whole. The process is about responding and creating a visual language that connects to the eye, through line and form. However, It’s not the easiest way of working because the paintings cannot be envisaged. They are reactive to the conditions of their own making. Which emerging artists in London do you admire? Rafal Topolewski, Laurence Owens, Thom Trojanowski Hobson and Stevie Dix. I wouldn’t like to work in any past art movements; it’s what’s going on now that gets me excited. "If you truly love nature, you’ll find beauty everywhere" - wise old Van Gogh. I’d like to say travel but it’s probably just all things colourful. How does the culture of South London impact your work? Although the culture itself doesn’t impact my work so much, I live and work in Brixton and the area has a wonderful spirit. It’s the energy that gets me going. What’s the significance of your colour palette? My choice of colour isn’t representative. There is a process of decision-making and aptness involved when choosing colours. Usually I limit myself to just four or five colours as it helps my focus when reacting to the forms whilst painting. Actually, there’s a bunch of present artists that I would like to meet such as Shara Hughes, Tamina Amadyar, Arlene Shechet. I would also like to go and visit Isabelle Tuchband’s house and studio in Sao Paulo, Brazil. I take photos with my phone of the different stages of my painting. Rotating the image and covering bits up is all part of the process. It’s also a good way for me to edit and evaluate my work when I’m not in the studio. Saying this, it's also vital that I immerse myself in the natural world as well as the cyber. I think Drumduan School founded by Tilda Swinton in Scotland has an amazing ethos for teaching. Have you ever questioned your career entirely? I’ve never questioned being an artist, but there are a million things that I want to do. What is your favourite art gallery in South London and why? My favourite London galleries are Rod Barton, South London Gallery, Newport Street Gallery and The Dot Project. Studio Voltaire in South London always has exciting new work; I find that I’m drawn to the less conventional spaces. South London’s art organisations and artist run spaces have loads going on; I’ve been to some interesting group shows of emerging artists at Maverick Projects and Safe house 1 in Peckham. I work within a community of artists. I like walking down the corridor and hearing heavy metal coming from one studio and classical music from another. From my experience it’s always been really important for my practice to engage with other artists. One day I would like to build my own creative community. Why do you make and receive studio visits? It’s interesting walking into the mind of an artist, I love studio visits because they allow people to explore the nature of the artist. The best thing about studios visits is discovering the thought process of the artist. What visual references do you draw upon in your work? Everything I engage with is a visual reference. The initial spark for a recent painting, Boketto was a tiny rectangle of masking tape that somebody had doodled on and stuck onto one of the walls near my Brixton studio. I’m not a morning person so it’s a slow start, usually spent flicking through Instagram or trolling through immersive psychedelic sites, reading art magazines, or catching up on a few Arteviste articles. But, when I start painting, it’s intense and wholehearted.